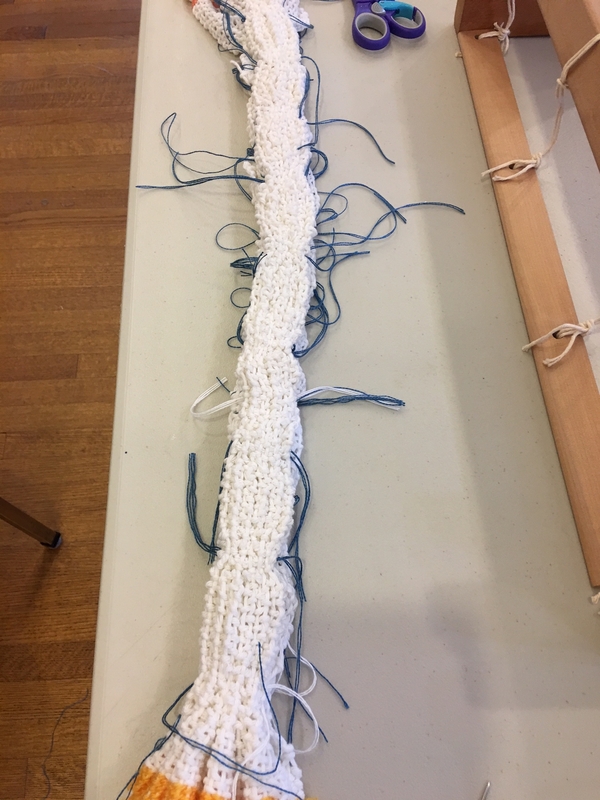 In the Rigid Heddle Loom Study Group I lead at the Weavers Guild of Greater Cincinnati, we are working on a woven Shibori project. 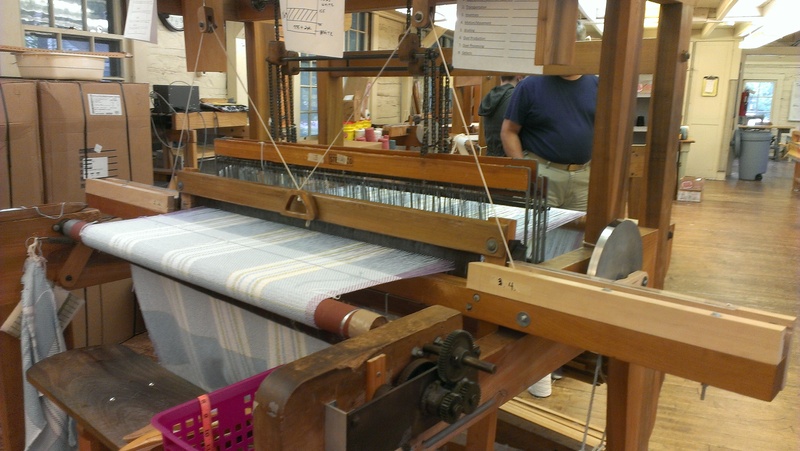 Last week we brought in our projects that we wove with supplemental weft. We got together to pull the supplemental weft threads to gather the woven cloth to create the areas of resist before dyeing. 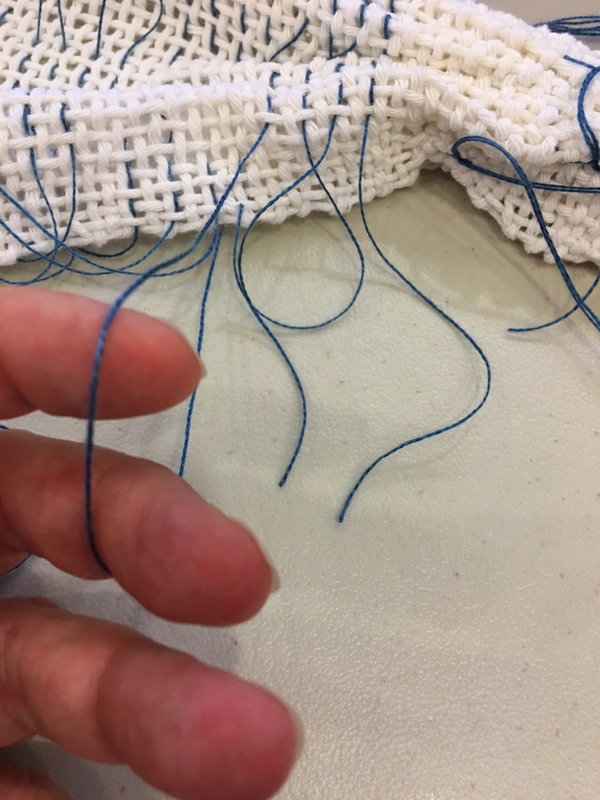 In the photo above I am pulling the blue supplemental threads along one side of the cloth. 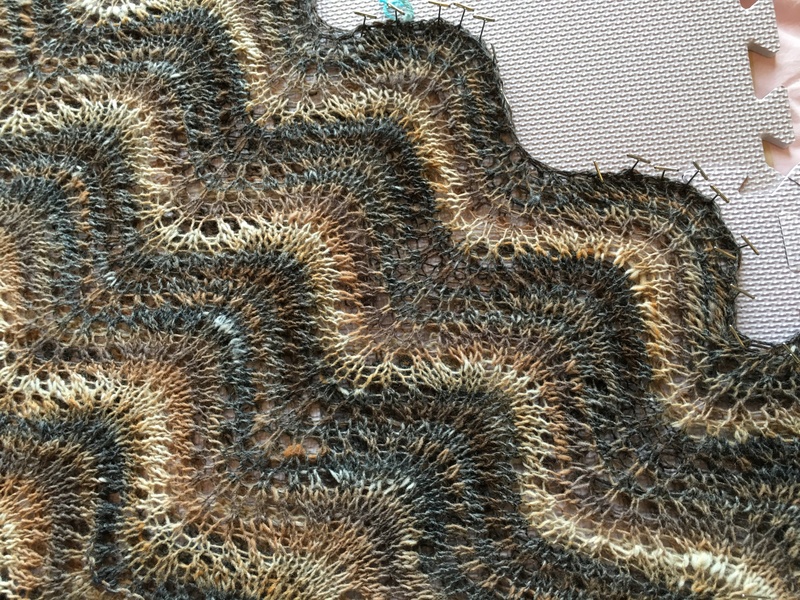 I pulled them in small groups that match the block patterns I was weaving into the cloth. 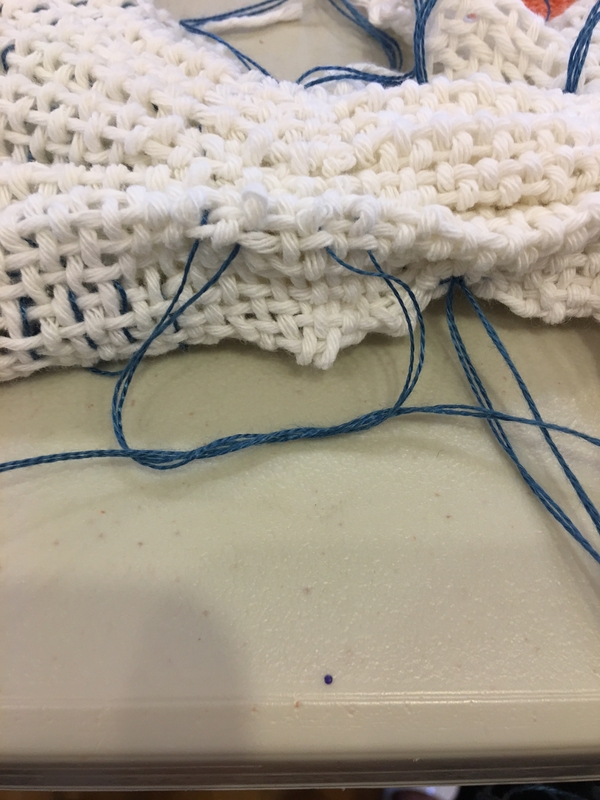 Pull them about halfway across the cloth (be careful not to pull out the threads from the other side) and tie the small group of threads into and overhand knot. Finish one side before starting the other. Next as you see in the above photos, I have started on the other side of the cloth. To make it easier to tie the threads into the block groups again, I snip the loops of thread as I come to them. Above is the fully gathered cloth after I snipped off excess dangling threads. Next up will be dyeing the gathered cloth in an indigo dye pot. 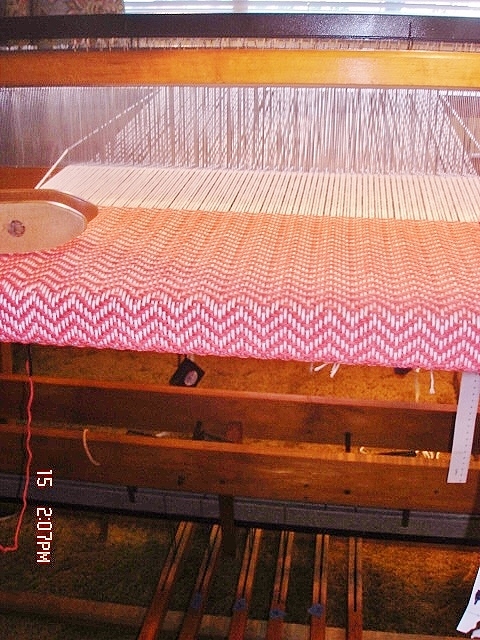 I’m taking a workshop on creating a mixed warp at the Weavers Guild of Greater Cincinnati. Today in the first 4 hours of the workshop, we learned a little about color theory and value. Colors may be different but have the same value on the grayscale. In our first group exercise we sorted yarns by value. Here is how they sorted out. Here is the sorted yarn viewed as a grayscale image. Sometimes they can really fool you. 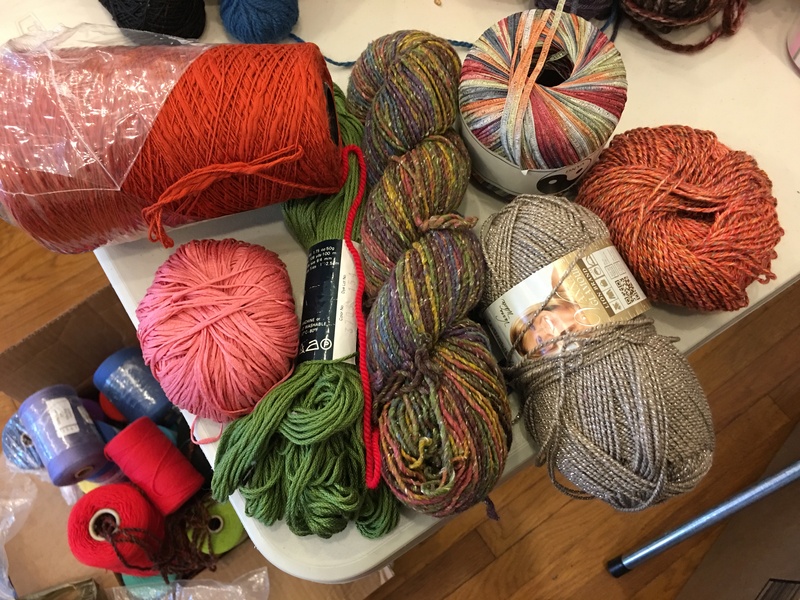 Yellows and yarns that have some variegation or sparkle can be very difficult to sort. One of the theories of choosing the yarns is they can be any different colors but will look good together as long as they are about the same value. 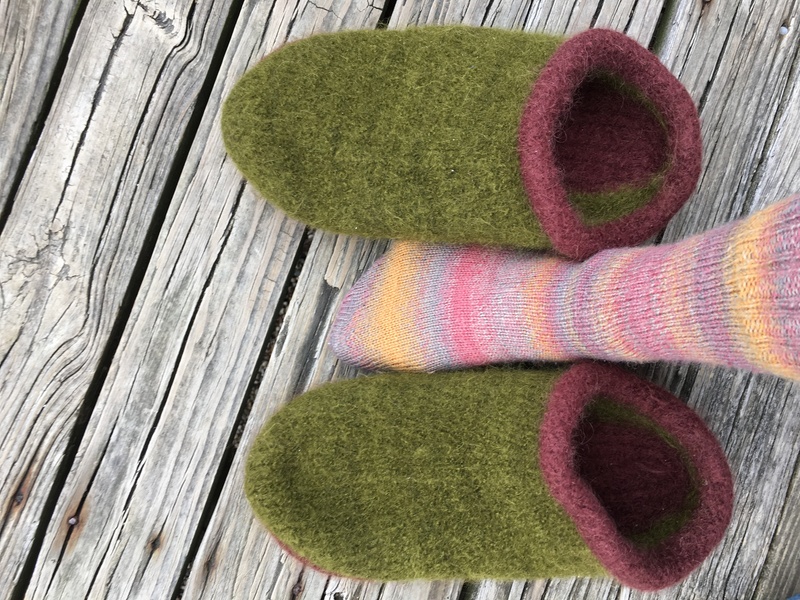 Then you have to consider your fiber types, and textures of yarn and decide what will fibers will do taking into consideration how they will stretch in the warp and shrink in the finishing. We learned about the properties of different fibers such as wool, acrylic, silk, cotton and flax and how to decide how well they will mix together. 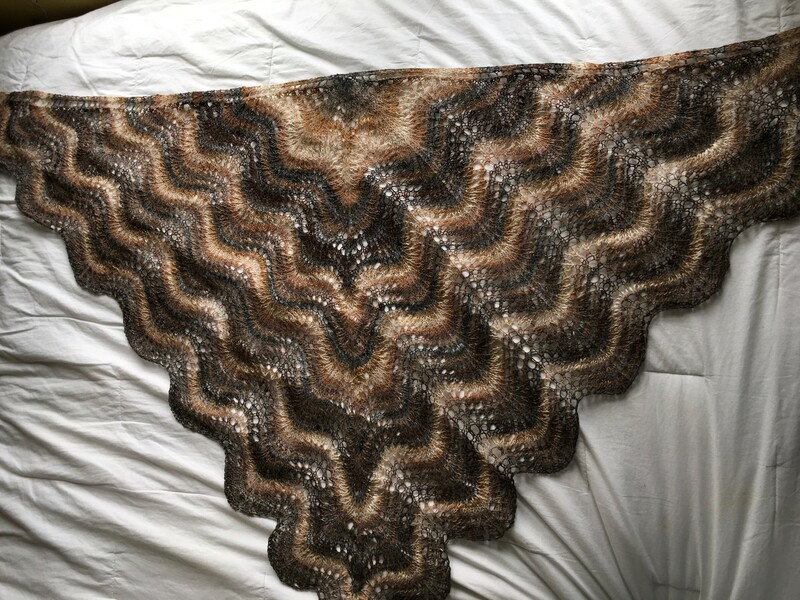 Then you choose something that will add a little “pop” of color or sparkle in the warp or to be used as a supplementary warp. In my first go through in selecting 5 to 7 yarns from what I had to choose from, this is what I came up with and here is how they came out on the grayscale. And here is what they look like in color. Its hard to see in a picture, but one of my yarns (the grayish one) had a little bit of silver sparkle to it. 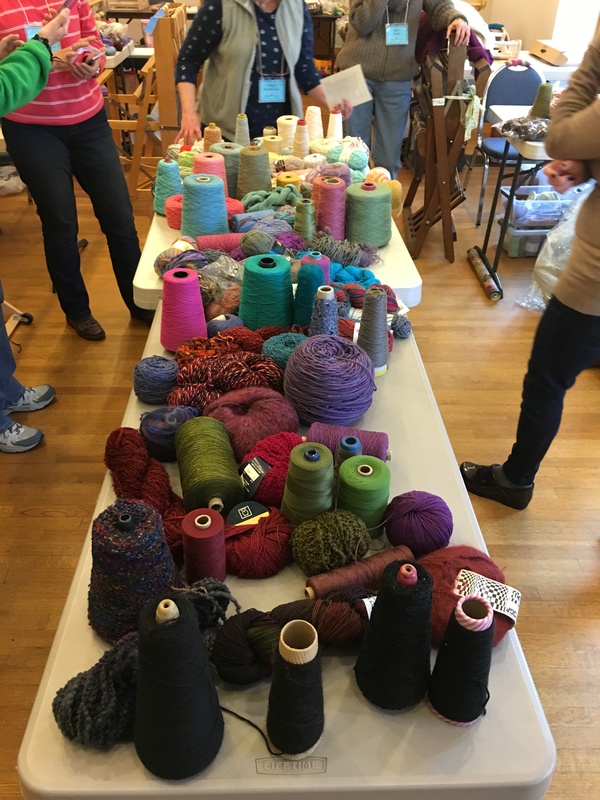 After choosing some possibilities, we learned how to figure out the sett (how close together they should be) of yarns of different thicknesses, taking into consideration the percentage of each we will be using, the structure we will weave and the weft we are going to use. That part can be very tricky. 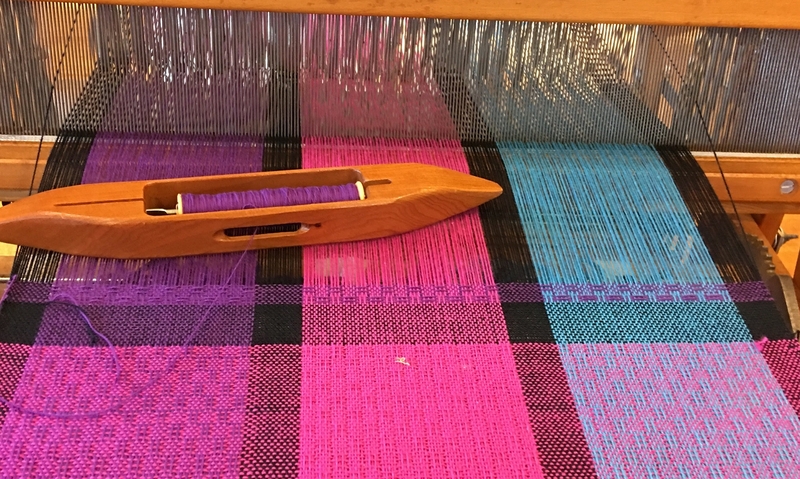 Tomorrow in an all day session we will lean different approaches to winding the warp and dressing the loom with a mixed warp. It should be a great day! I have been going to Suzanne’s house on Wednesdays to teach her to weave on a floor loom. 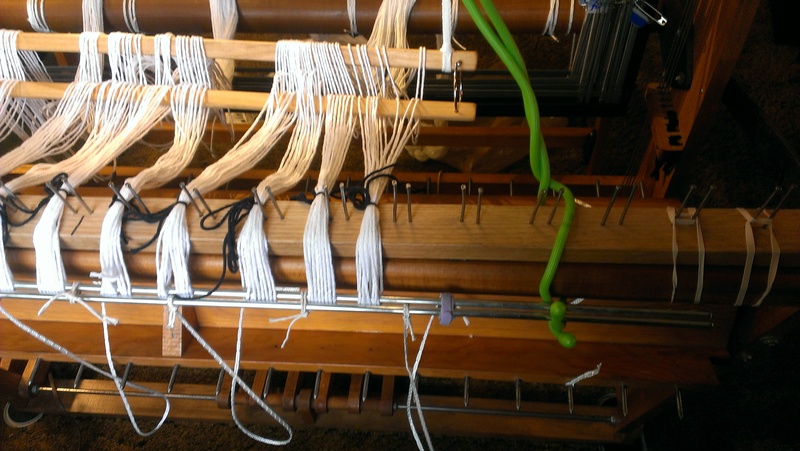 She had been weaving on a rigid heddle loom on her own, and decided to buy a floor loom. 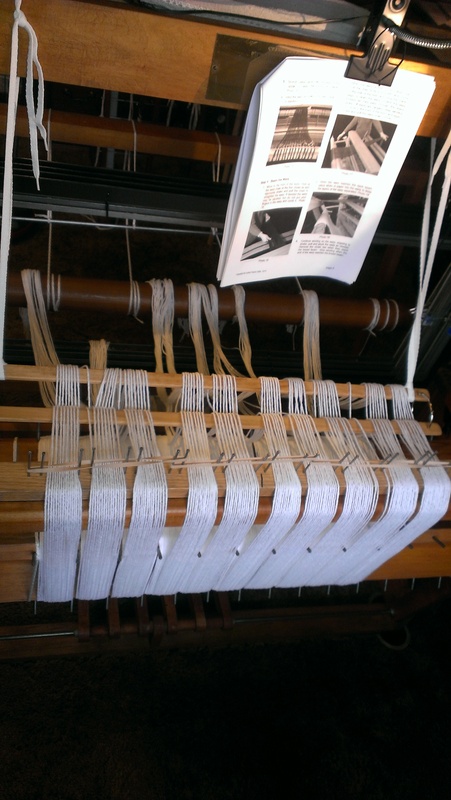 She found a used 4-shaft Macomber loom in okay shape, but it needed some TLC. 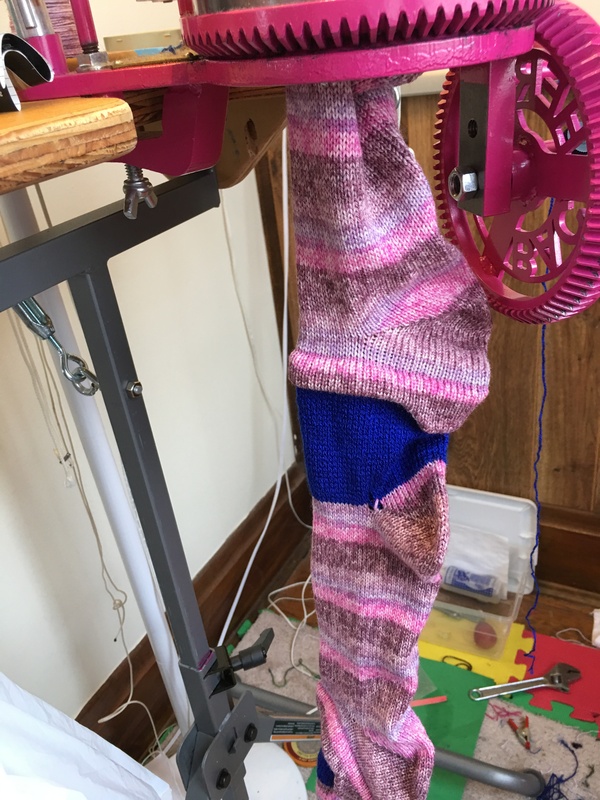 I went over one day and gave her a written evaluation of what she had bought, what she still needed to do to get the loom in working order, and what she still needed to buy or make in the way of tools and accessories. I showed her how to put the rachet brake back on the loom and sent her instructions to make lease sticks and a special raddle to work with her sectional beam. She cleaned up the wood with Old English; de-rusted and painted the shaft; de-rusted and polished the heddle bars; sorted heddles on a jig so that the tops and bottoms were aligned, alternated in an A and B pattern and then replaced them on the heddle bars; replaced the dirty old old apron and dry rotted apron cords with some Texsolv then was ready to weave a couple of weeks later. 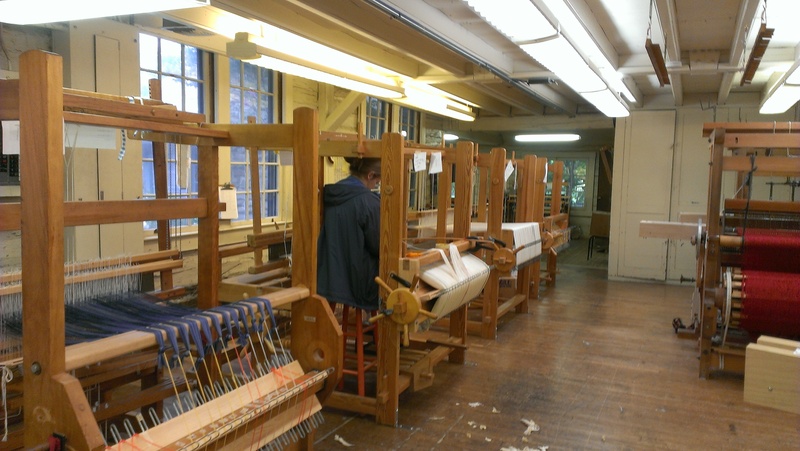 The second time I went to her home, I taught her how to wind a warp on a warping board and warp back to front onto the sectional beam without any special sectional warping equipment. 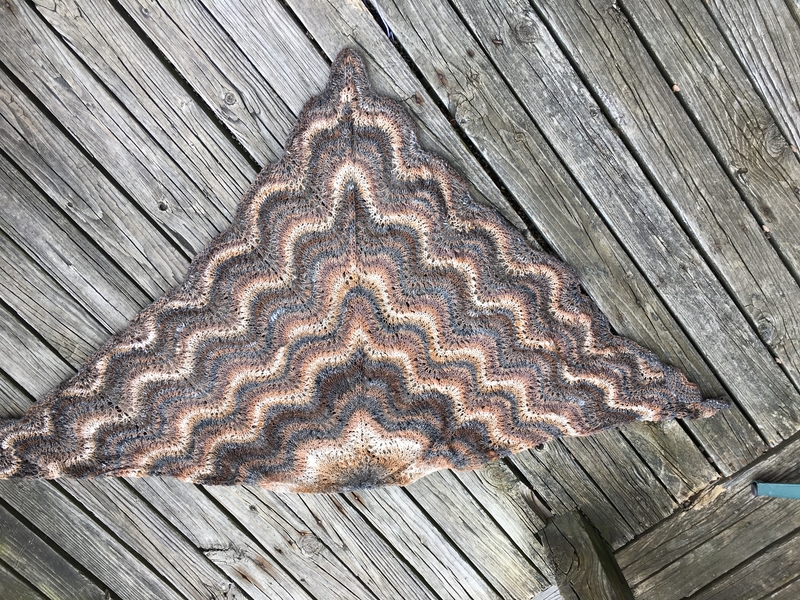 The warp went on easily and before she knew it, she had the heddles threaded and the reed sleyed in the pattern from my Dishcloth Cotton Point Twill Towels project that I use when teaching people on their own equipment. 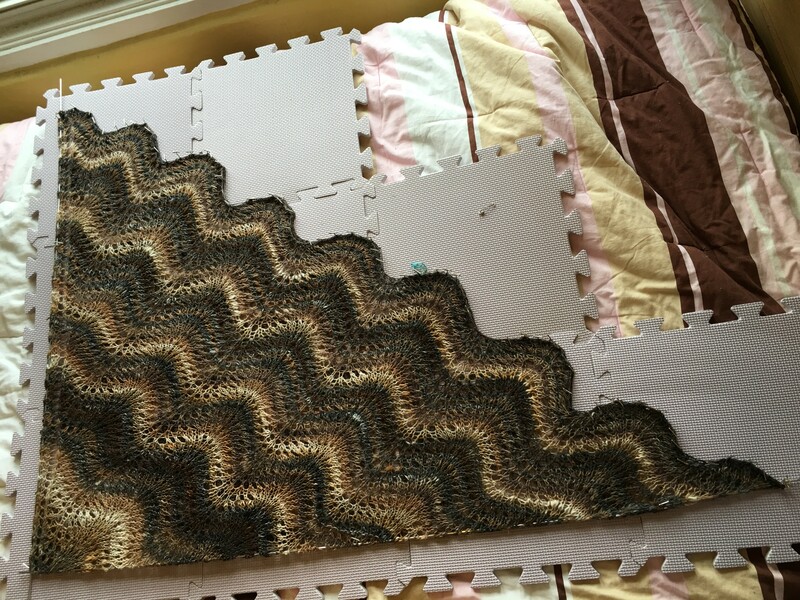 I call it a “get to know your loom” project. The third time I was there, we troubleshooted for crossed threads and added the floating selvedges. 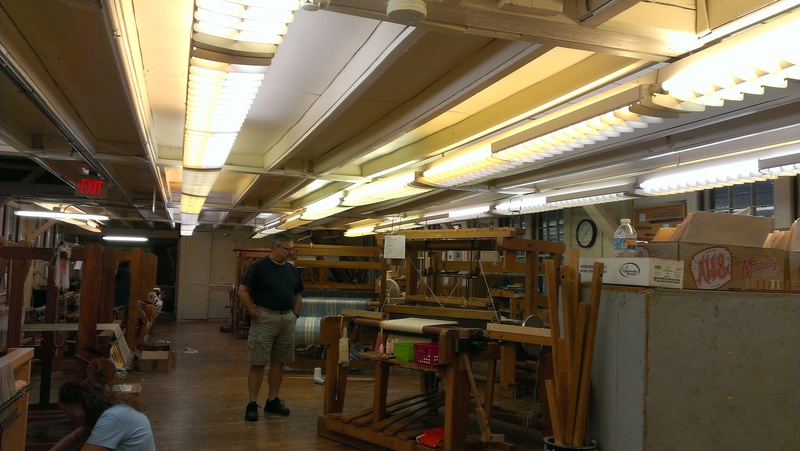 She learned about the tie-up and treadling portions of the draft and how to change the tie-up to “walk” the treadles. 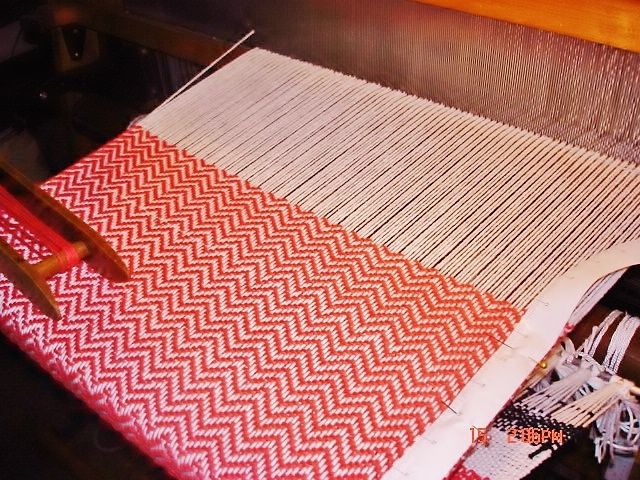 We began with a plain weave hem and then she started weaving the first treadling pattern. 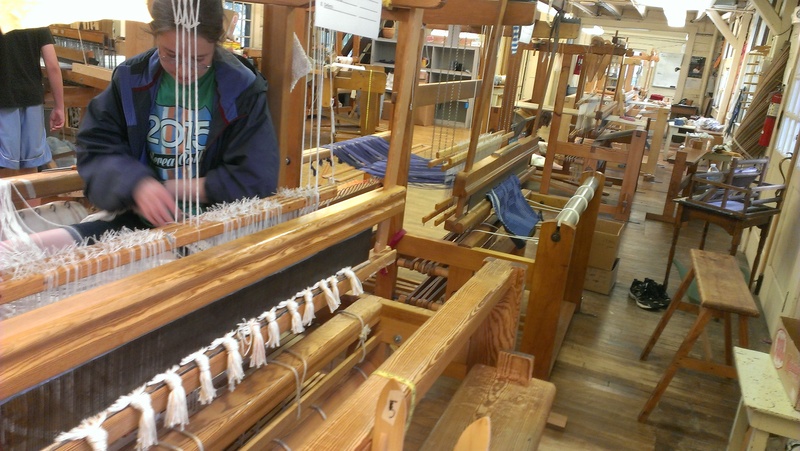 She is now weaving away on the towels and will treadle some different patterns. The next time I go back, we will cut them off and she will learn about wet finishing and hemming the towels.